Nonetheless, “takin’ care of business” is exactly what these Tigers continue to do … mixing brutal efficiency on the field with an infectious glee in their dance-happy locker room after they win. And winning is fun … well, usually. 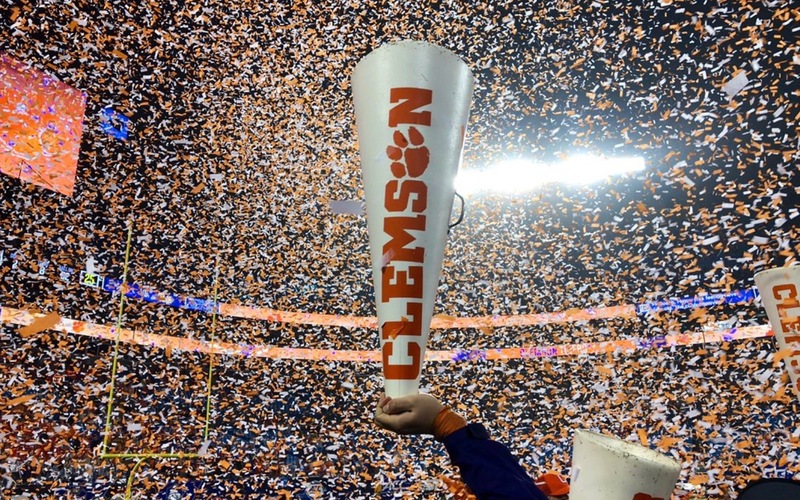 A week after their head coach chided fans (and some in the media) for being “unsatisfied” with Clemson’s historic gridiron exploits over the past few years, the second-ranked Tigers (13-0, 8-0 ACC) demolished ACC coastal champion Pittsburgh to capture their fourth consecutive conference championship (a record in the divisional era). 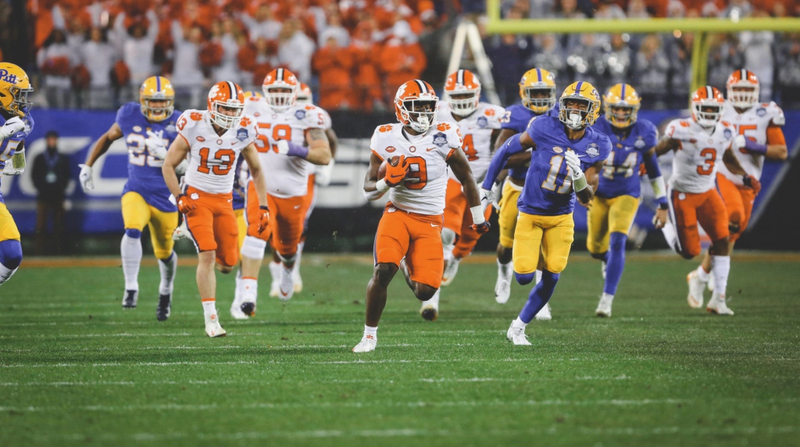 After letting the Panthers (7-6, 6-2 ACC) hang around for the better part of the first half, Clemson scored a pair of touchdowns in the final five minutes of the opening stanza to take firm control of the game – and their playoff destiny. 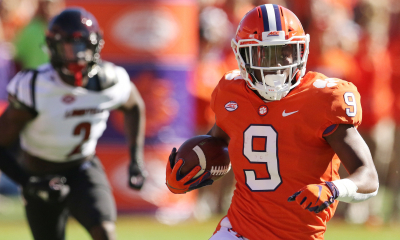 Both scores came on passes from true freshman phenom Trevor Lawrence to sophomore sensation Tee Higgins – with the second set up by a 31-yard interception from all-ACC defensive back A.J. Terrell. After going great guns a week ago in the Tigers’ rivalry win over South Carolina, the second team all-conference signal caller was limited to only 12 of 24 completions for 118 yards and the aforementioned two scoring passes. 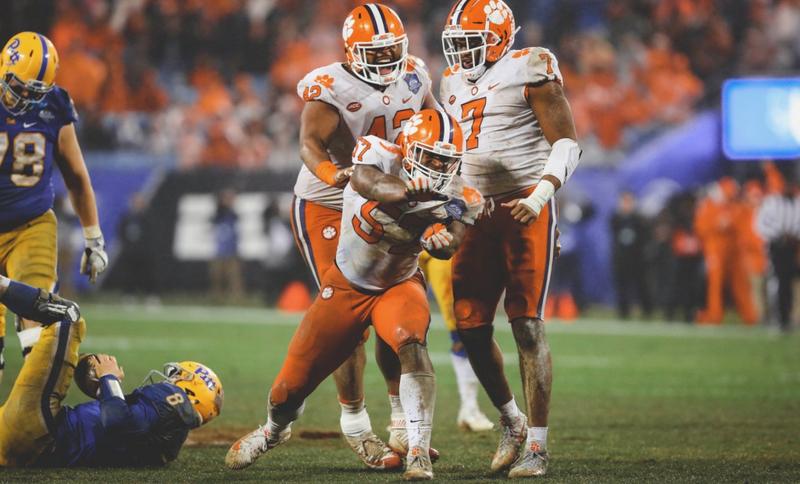 Still, Lawrence moved to 9-0 since taking over as Clemson’s starting quarterback in late September – an announcement that led to the transfer of graduate senior Kelly Bryant. Lawrence didn’t have to light it up on a rainy night in Charlotte, N.C., though. Especially not with sophomore tailback Travis Etienne – the 2018 ACC player of the year – gashing the Panthers’ defense for 156 yards on twelve carries and a pair of scores on the ground. The 5-foot-10, 200-pound native of Jennings, Louisiana now has 1,463 yards and 21 touchdowns on the season – numbers which are even more amazing when you consider the number of carries Clemson gives its backup tailbacks Adam Choice , Tavien Feaster and Lyn-J Dixon. The best news of the night for Tiger fans? 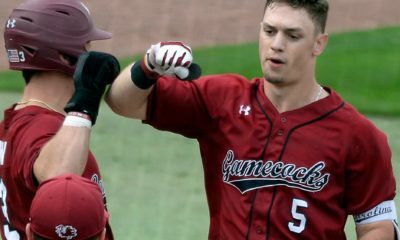 The return of their dominant defense – which was badly exposed last week against arch-rival South Carolina. 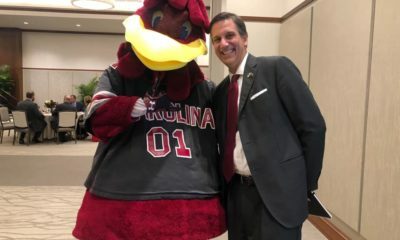 After giving up 600 yards to the Gamecocks – 510 of them through the air – the Tigers clamped down against the one-dimensional Pittsburgh offense, limiting head coach Pat Narduzzi’s team to just 200 total yards (and only eight yards passing). 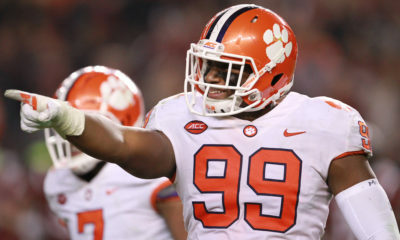 The Tigers’ future NFL stars shone brightly through the cloudy Carolina sky, generating two sacks, nine tackles for loss and three turnovers. Junior linebacker Tre Lamar (above) – used to playing in the shadow of the Tigers’ dominant defensive line – had one of his best games of the season against Pitt. 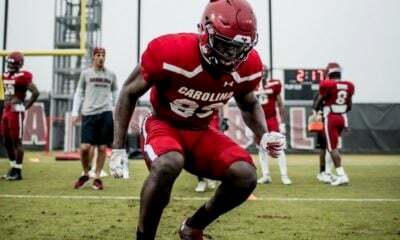 The 6-foot-4, 255-pound Roswell, Georgia native recorded a team-leading nine tackles – including a sack and two tackles for loss. The Panthers – the latest in a long line of teams to be manhandled by Clemson – were impressed. Narduzzi’s statement bears particular consideration in light of the fact his team nearly upset No. 3 Notre Dame in South Bend, Illinois in mid-October. The Panthers led the Irish late in the fourth quarter in that closely contested match-up. 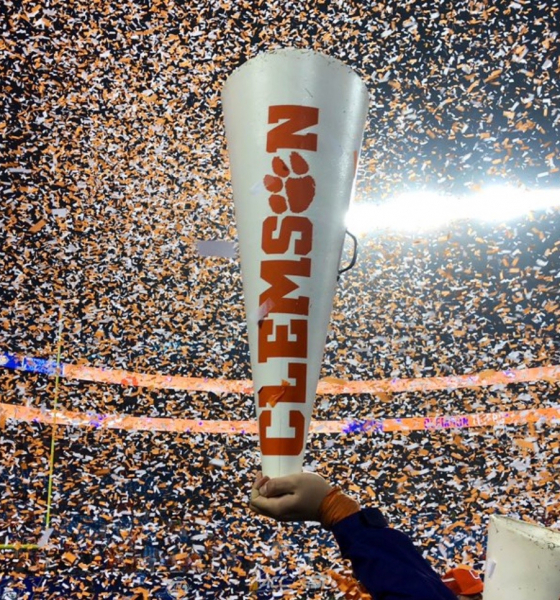 Like the Irish, Clemson will await the reveal of the final College Football Playoff (CFP) standings on Sunday. All signs point to the Tigers earning a No. 2 seed in the four-team field, their fourth consecutive playoff appearance.